A large number of fundamental chemical processes require the activation or cleavage of strong bonds in small, inert molecules. In the biologically essential process of nitrogen fixation, the enzyme nitrogenase manages to break one of the strongest chemical bonds in nature under mild conditions. In stark contrast, the corresponding industrial process, the Haber-Bosch method, requires extreme temperatures and pressures to perform the same function. We are addressing this imbalance by using computational chemistry to design powerful and elegant metal-based systems for the activation and cleavage of multiply-bonded molecules such as N2, CO and CO2which are basic feedstocks for chemical industry. 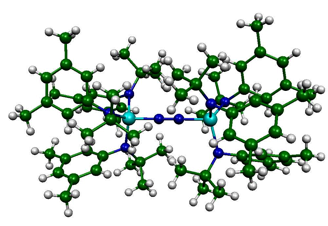 Recently, we have developed a computational strategy for designing metal complexes which optimize the activation and cleavage of such small molecules and to date have successfully designed three- and four-coordinate metal complexes which are capable of cleaving the multiple bonds in a number of small molecules including N2, CO, NO, CN, CS, CO2, CS2and NO2. We have also shown that it is possible to tune these metal systems to selectively cleave one bond over another in non-symmetric species such as N2O and NCO. Optimized structure of the dinitrogen-bridged, three-coordinate di-molybdenum complex [Ar(tBu)N]3Mo-N=N-Mo[N(tBu)Ar]3. Three- and four-coordinate complexes of molybdenum and niobium which bind small molecules such as N2, CO, NO and CN−.